Need I say more? I'm sure I'm not the only one waiting for Fridays. Or am I? It just seems we live for Fridays and the weekends. Am I right or am I right? Yesterday was another day at the doctor for yours truly. It's with the ophthalmologist this time. Honestly, I don't understand why I still have to see him since we already know what 'possibly' caused my left eyelid to retract....hyperthyroidism...and my eye is getting better already. I thought my visit was just a follow-up to make sure my eye is really getting better. Guess what? The doctor has some other theory. My eye problem MAY NOT get better even if my thyroid problem gets fixed. Why? Because I may have what is known as Thyroid Eye Disease or TED. Ugh! So, I am scheduled to see him again in 4 months time. I'm just glad that my eye problem was caught early on. From what I've been reading, this disease is often misdiagnosed to something else which can result to more serious problems. Anyway, we also asked him about the little one. We're getting worried because she gets headaches quite a bit. It usually starts with her complaining about her eyes then it goes to headaches which can sometimes make her throw up. The doctor said that he doesn't usually see children [he normally recommends a pediatric ophthalmologist] but he made an exception and opted to see the little one in a couple of weeks. Why did he agree to see her? Because she seems mature enough. Great, eh? Good for you that your eye problem would be treated so no more further complications for you. And with regards to the li'l one, not surprising at all coz she has a matured mind. he he. Now that you'll plant those trees around you, be careful with leaves here, there and everywhere. ha ha ha! Yesss! Weekend na naman! Wala ng outing dito. Bagyo bagyo na kasi! It's good you have another check up para may follow up ulit. About your little one, baka naman kelangan niya ng glasses? It's good too that she'll be checked para malaman na. 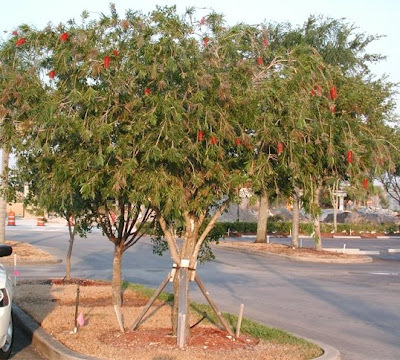 Ganda naman yang bottlebrush tree! Enjoy your weekend Mommy Juliana. I like the tree. will that grow tall or it's just going to be about that size? Haven't heard of TED before. I hope your Doc finds the right treatment for it. E may need to wear glasses. Sana corrective lang para she won't have to wear one when she's older. Got the response. So now let the hiding begin... Grabe 'noh? Hey Mama, yey it's Friday! Good luck on the tree planting. Sounds like the rain has finally stopped ha? The heat is on here too and humid. No big plans for the weekend. glad to hear that your eye problem got diagnosed early and hope your little one will get the same results from your doctor...sounds like he is very knowledgeable ophthalmologist. super great Saturday dito. hope you'll get the chance to plant that tree tomorrow. musta na? i'm just so lazy today and bored as well. hee hee. hope ok na eyes mo at sana naman sa princess mo wala. dito ulan ng ulan pero buti naman ngayon umaraw na, weird nga kc summer pero parang spring pa rin.